The National Nuclear Security Administration’s Office of International Nuclear Safeguards presented this year’s Joule Award “in recognition of outstanding contributions made for transferring: 19F(α,n) Na Cross Section for Uranium Enrichment to international partners.” The Versatile Array of Neutron Detectors at Low Energy, also known as VANDLE, array of plastic scintillators, developed with Stewardship Science Academic Alliances funds, was critical to the success of this project. Also important were the students and postdoctoral associates supported in part by the Rutgers University Center of Excellence for Radioactive Ion Beam Studies for Stewardship Science, and the Notre Dame Nuclear Science Laboratory. The final report for this exciting work, entitled “A Kinematically Complete, Interdisciplinary, and Co-Institutional Measurement of the 19F(α,n) Cross Section for Nuclear Safeguards Science” is available online at http://www.osti.gov/scitech/servlets/purl/1263500. 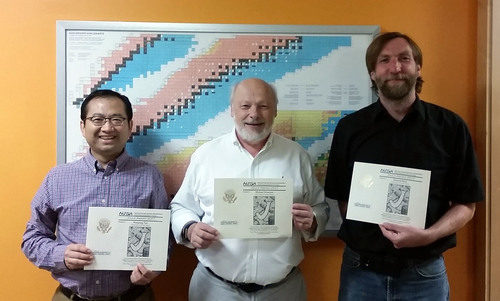 Full NSL participation list: Craig Reingold, Tony Battaglia, Yingying Chen, Alex Long, Stephanie Lyons, Chris Seymour, Kevin Siegl, Mallory Smith, Sabrina Strauss, Dan Bardayan, Edward Stech (pictured, right), Wanpeng Tan (pictured, left), and Michael Wiescher (pictured, center). Originally published by Janet Weikel at isnap.nd.edu on August 11, 2017.